Painting outdoors is a great way to energize your painting. It can be frustrating and challenging, but it’s also different and fun. It really does not matter if it’s warm or cold. Be prepared and it will be a great experience. I like to do small (5×4) or (10X8) quick sketches – capturing light and colour without a lot of detailed drawing. I usually take a simple pallet with a few select colours and 2 or 3 brushes – keeping it simple. I also spend a lot of time looking and learning before I start – watching for light, cloud patterns, how shadows are changing. Then I find something to paint! 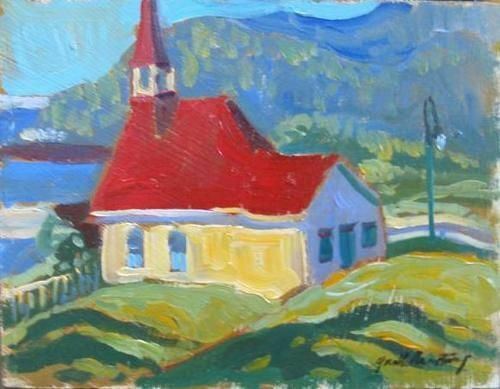 Outside is easy, as there is always something going on – a building, a tree, a boat, a pathway, a bench, a flower bed, people relaxing, interesting cloud shapes, or sometimes it’s great to paint nothing – an empty field, a quiet beach, a rolling skyline with lake and a big sky. Then compose. Quarter the painting and keep the focus away from the middle – horizon line, tree, cloud formation etc. Contrast is important for a good sketch – light / dark, big / small, warm colour/cool colour, etc. And remember – sketches are sketches – keep it quick and simple. And if it doesn’t work out – scrape it off and try again. 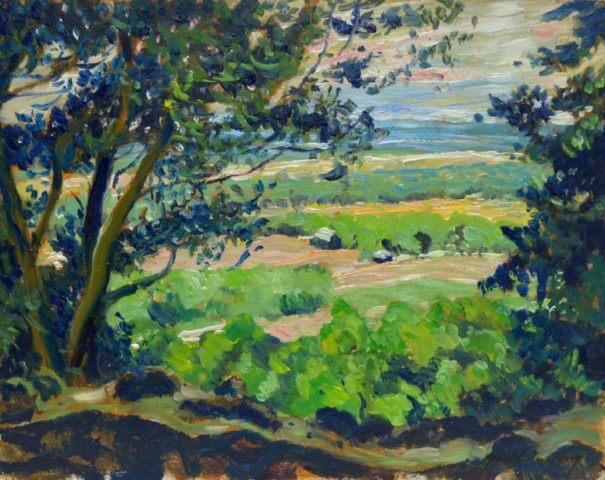 “En plein air,” is the French expression for “in the open air.” Plein air painting is about leaving the four walls of your studio behind and experiencing painting and drawing in the landscape. The practice goes back for centuries but was truly made into an art form by the French Impressionists with their desire to paint light and its changing, ephemeral qualities.